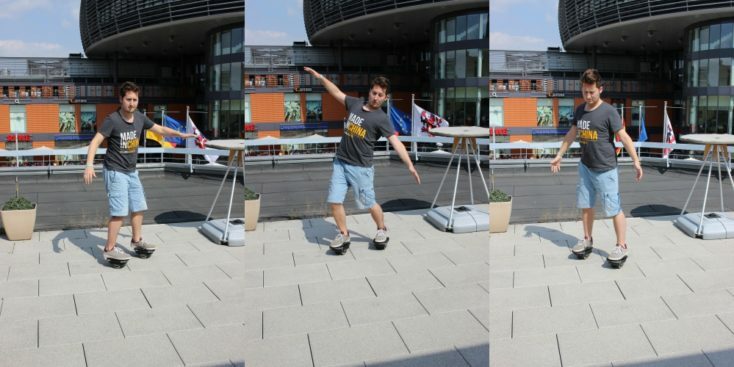 So-called hoverboards are also occasionally seen on the streets in Germany. 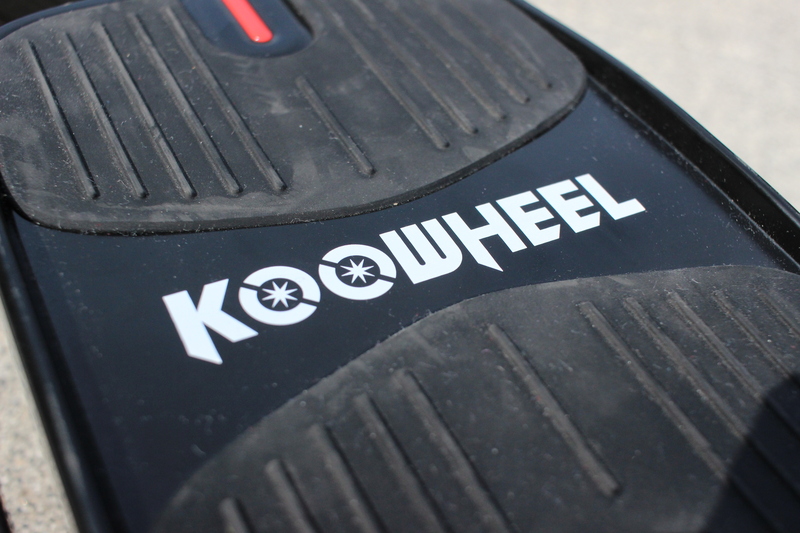 The Koowheel Hovershoes work according to the same principle. The difference: both feet stand on a separate castor, which makes for a slightly different driving experience, but also offers a few more possibilities. We drove it ourselves and will tell you what to think of the shoes and what you need to bear in mind at the beginning. As with the functionality, the name is based on the familiar boards. Really “hovering” does nothing here, of course. The name probably comes from the fact that the even and flowing forward movement without moving the legs feels a bit like floating. The difference here: The Koowheel shoes balance themselves continuously when switched on, while the hoverboards tip over without a driver. The start is actually very simple. You switch on the “roller skates” and set them up. Usually they then balance within a second and can be released. It sometimes takes a while (~10 seconds) for this to happen. Now you can already nudge the Koowheel and see it rolling by itself until it hits an obstacle. Riding on hover shoes is not necessarily difficult, but requires some practice. How much varies from person to person. It is definitely not true that everyone learns how the manufacturer promises in five minutes. In my opinion they are much more sensitive than the hoverboard. Unlike the two-wheeled version, you clearly notice the pull of the engines here, which take some of the work off your hands. You don’t have to lean forward, but really only exert a little pressure with your toes. In addition, both feet/legs must be moved independently of each other. If you have problems coordinating your feet while skating, skating or roller-skating, you will notice the problem here too. Faster than you know, you are in a balancing act, which is reinforced here by the fact that the hover-shoes, once in motion, want to continue driving as long as pressure is exerted on the front part. As I said, it’s all a matter of practice. I had few problems to stay on the reels, but I have several hours of experience on the hoverboard. It wasn’t so easy for some of my colleagues here. At the beginning you should let yourself be taken by the hand – figuratively and literally (seriously, hold someone’s hand the first time you try). If it pulls your legs away, you’ll have some support. Well, you won’t have to do the handstand on it; riding on one leg and letting the second KOOWHEEL roll alongside, that’s already possible. Once you’ve got it out, you’ll be able to make quite a lot of curves, and overall you’ll be even more mobile than on a hoverboard. The maximum speed is 12 km/h, if you reach it, the shoes will also warn you with a beep and will not accelerate any further. The headline says it all. The floor should be smooth, otherwise the hovershoes are no fun. Asphalt and concrete are good, even short carpets are suitable. It is best to drive on the floor of the gym, if you have the opportunity. It rolls well on tiles, but the joints between them are already very disturbing. Paving stone is unsuitable, not only because it is less fun, but also because it simply becomes less safe. Are the Koowheel Hovershoes an actual means of transportation or just a gimmick? Here I must say: rather the latter. While e-bikes and scooters are still something for the way to the track or even to work, the hovershoes are left in the cupboard. Too rarely you really have the right ground, even the hoverboards with their 5-6 inch wheels ride better here. In addition, driving becomes strenuous in the long run. Basically it is fair to say that the hovershoes are a kind of roller skates. The concept is basically the same, but the Hovershoe are a modern interpretation. 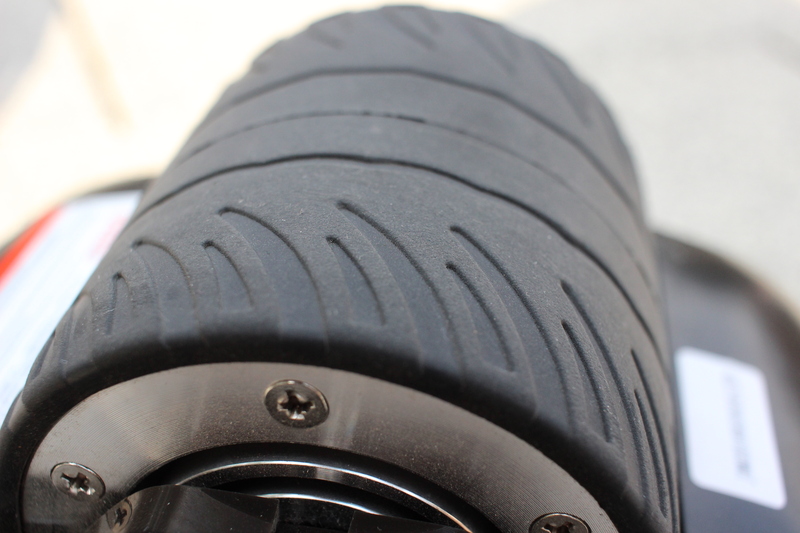 The tread is patterned and offers a relatively good grip. 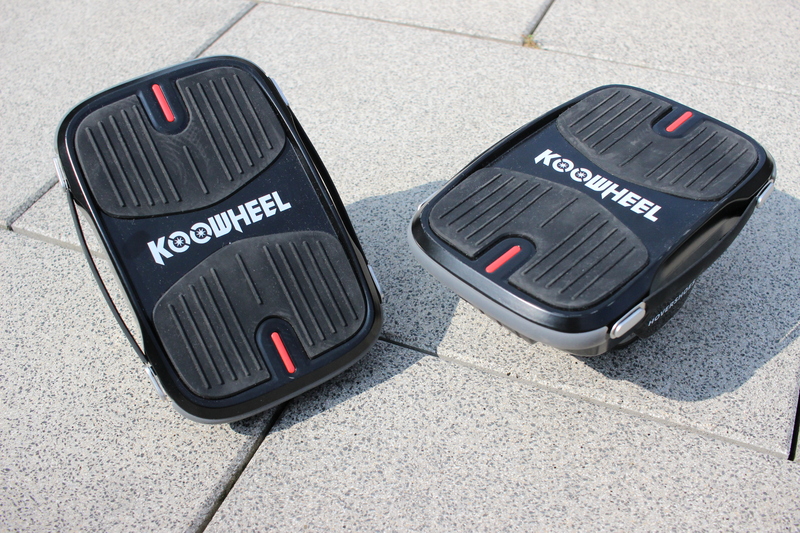 Both Koowheels are optically indistinguishable from each other and can function both as left and right hovershoe. Instead of inline skates in a row, there is only one roller under each Koowheel hovershoe. However, this offers a relatively broad profile. It is also noticeable that the electric roller skates even have LEDs to make them visible to other people, especially in low light. But they do not show where the front and rear are, but glow green when switched on and turn white as soon as they are in balance. The hovershoes are 22.5 cm long and 13.5 cm wide, the tire diameter is 3.5 inches. We have a weight of 3.3 kg per shoe, so they are really not lightweights. The maximum permissible weight of the driver is 130 kg. According to the description, the hover shoes also have an IP65 rating, so that they are protected against splash and spray water. In each shoe is a 250 W motor, which brings the shoes to a maximum speed of 12 km/h. The maximum gradient to be mastered is only 9°, you will not climb mountains. The battery capacity is 2000 mAh and can be charged within 2 hours. Of course, both shoes are charged separately, but with a charger that has two charging plugs. This results in a total range of 10 km. Similar to the hoverboards that preceded the shoes, the Hover shoes are unfortunately not approved for use on many European roads. After all, they drive faster than 6 km/h and have no brakes. Lighting can be a problem. The following also applies here: only use on private property is permitted! Conclusion – How good are the hovershoes? New ways of locomotion? Always with pleasure! The Koowheel Hover Shoes for almost $500€? Not necessarily. The Hovershoes are clearly inferior to a Ninebot ES01 or the M365 from Xiaomi. But you can get really creative and maybe even find a new hobby in it. They would also be suitable for short distances with the right ground. Conclusion: The hovershoes can be really fun. But as a replacement for the bicycle? I don’t see that coming. Moreover, there will probably be some price changes before they become interesting for a larger group. What do you think of the “Hovershoes”?